Layout is a mechanism of arranging objects or elements on a paper, screen or in a physical world according to the vision of an individual, a group or an organization. In web development, the concept of layout is no different, defining a layout is how the consistency of a web pages across the website is ensured. Using any platform for a website, defining a layout is the first step in web development, some platforms refer layout of a page as a master page too, but in an essence, layout is how the structure of any website is formalized. 1) "<div>" tag approach is flexible but, requires a lot of effort on customization of CSS part, layout needs to be separately construct for mobile platforms. In this approach, front-end web developer needs to create and hard code his/her own CSS classes depend on target screen. This approach is not very adaptive to different screen sizes and a lot buggy in nature. 2) "<table>" tag is strict mechanism and is not adaptable for mobile screens in most of the cases. In this approach, front-end developer needs to create a lot of tables to define the strict layout of the website. This approach is very strict method of layout and not adaptable to screen sizes. Also, maintaining a lot of tables in a large application becomes difficult. Bootstrap CSS is a CSS based framework for designing a web structure with less effort. Its flexible and uses a mobile first approach i.e. front-end developer do not need to develop any extra CSS classes to meet the target screen sizes. The idea of Bootstrap CSS is to use one framework to design layout for all screen sizes e.g. front-end developers can use one framework and design two separate layouts i.e. one for web and one for mobile web or can adjust one layout for both web and mobile web. Bootstrap CSS framework offers following features i.e. Following are the list of few from many features Bootstrap CSS layout grid system offers i.e. 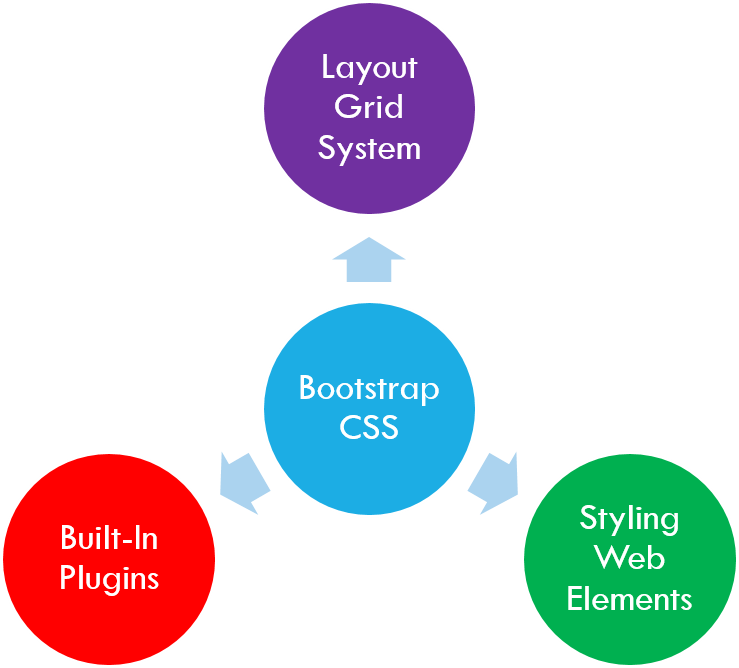 Grid container is the base structure of "Bootstrap CSS" which arrange all the content on screen within. There are two types of grid containers i.e. Container class is the basic class of Bootstrap CSS layout grid system. It adds padding around the content and wrap the content within as shown below i.e. The above code, can be used in a simple plain "HTML" page that shows how container class is structured. Container-fluid class utilizes entire width of the screen and do not add padding around the content as shown below i.e. The above code demonstrates how container-fluid class is structured. Rows and columns are arranged using "row" & "col-screen-*" classes where "screen" define the type of screen you wish to target and * is between 0-12 which define width of the column. The screen parameter is as follow i.e. As already mention above that column classes consist of 4 screen sizes with 12 set of width. Here below is how can we add them all together i.e. In the above code, I am adding three screen sizes together i.e. extra small, small & medium, "col-xs-12 col-sm-6 col-md-4" and here how they will look when screen size is change (you can experiment in browser by changing browser zooms) i.e. In Bootstrap CSS framework offsetting a column means that how much left margin is needed to move the column. "col-screen-offset-*" class is used to move column left i.e. In the above code, we have move our columns to have following arrangement on screen i.e. In Bootstrap CSS framework ordering a column means that how much we want to push or pull a particular column in a row. "col-screen-push-*" & "col-screen-pull-*" classes are used to order a column i.e. In the above code, we have order our columns as follow i.e. Notice in above image that we have change column 1 with column 2, here we have used Bootstrap CSS ordering classes to do so, instead of manually editing the code to achieve above arrangement. Following are the list of few from many features Bootstrap CSS offers for styling the web elements i.e. This feature allows to highlight particular text elements within large paragraph. It uses "" tag to highlight background of the test and "" tag to underline the text as demonstrate below i.e. In the above "mark & ins" tags will highlight the column 1 particular text as shown below i.e. "kbd" tag is used to highlight the keyboard user input keys as demonstrated below i.e. In the above code, "ctrl + c" line of code will highlight the keyboard key "Ctrl + C" as shown below i.e. Bootstrap CSS "table" class can be used to style tables web elements on a website i.e. In the above code, we have used "table-striped" class along with "table" class to have alternate color for table rows as shown below i.e. Above code execution is shown below i.e. Following are the list of few from many features Bootstrap CSS offers as built-in plugins i.e. Bootstrap CSS frame uses combination of "button", "ul", "li" & "a" tags to create a very stylidh dropdown menu as demonstrated below i.e. Above code will show following stylish dropdown plugin i.e. Modal is a very useful plugin, especially, when we want to show particular information on existing page with interactive behavior instead of loading a new page or using heavy plugins for such matter i.e. Modal will look like below image i.e. Tabs on a page is another useful plugin offer by Bootstra CSS framework i.e. Execution of above is shown below i.e. Bootstra CSS framework offers a very interactive popover plugin, which can be utilize to display bubble messages i.e. Execution is shown below i.e. Depend on the type of website, slider plugin is very handy to highlight feature posts on a website or afvertising something i.e. In this post you will learn about background of layout a web page traditionally and you will learn about Bootstrap CSS framework. 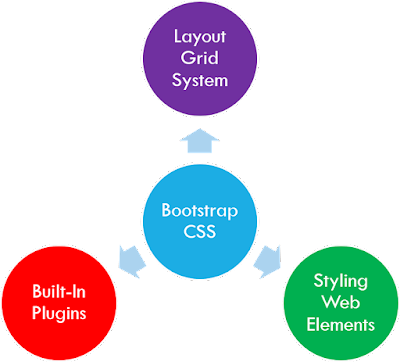 You will also learn about bootstrap CSS framework layout grid system, styling of web elements using variety of bootstrap CSS classes and few fro many plugins that bootstrap CSS framework offers in order to make website interactive and user friendly. Working samples can be downloaded. Most of the Code sample are used from W3Schools. I do not own any sample code except that alterations are made into the sample codes to meet the desire execution. thank you for your support, they layout is not paid, I modify it a bit, also, this blog is shifted to www.asmak9.com more updates are/will be available there. Hope you enjoy them.